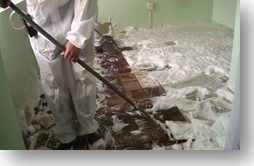 Traditional methods of removing asbestos involve encapsulation of the area and removal of the asbestos floor tiles using jackhammers and by dry grinding the floor. Workers inside the containment are relying on negative air and personal protection equipment only. 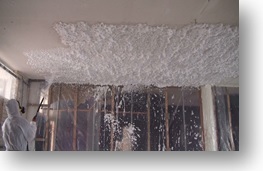 Traditional methods for asbestos ceiling removal involve the encapsulation of the area, spraying water onto the ceiling and removing the asbestos with scrapers. 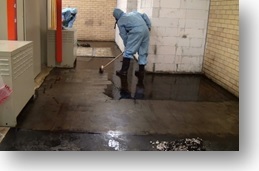 Water does not encapsulate fibres and may possibly flood the work area. Workers inside the containment are relying on negative air and personal protection equipment only. Some mastic (commonly called “black jack”) consists of a heavy duty adhesive that has asbestos content. Able to survive heat or fire, mastic was an especially strong glue that could hold almost any surface together. Due to its adhesive properties, mastic can be difficult to remove. Powered by Locke Design Omnimedia Copyright 2012, all rights reserved.